The Gaver family made headlines a month or so ago for their brawl with police in a Walmart carpark near Cottonwood in Idaho. I wrote on the story here. I’ve been keen to hear an update on the story for all we have so far is the law enforcement side. I always hold to the principle that there are two sides to every story and I’d like to hear the Gaver’s version, but for some reason there seems to be a blackout on any further news. 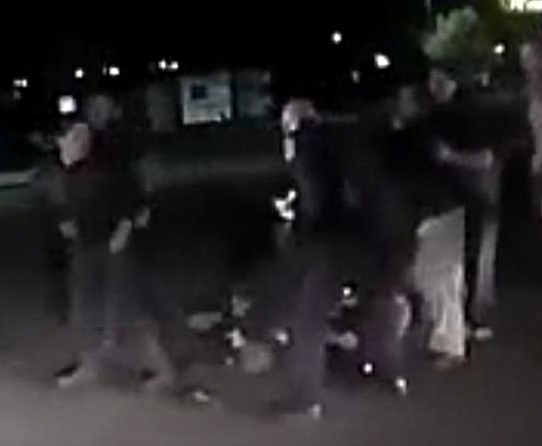 What I did find is a news item that says one of the Police officers in the brawl, Cottonwood police Sgt. Jeremy Daniels received a $10,000 check from the Maricopa County Sheriff’s Office Memorial Fund, a non-profit that raises money to help families of injured and fallen officers throughout Arizona. A couple of updated facts do emerge from the story. Apparently the whole thing started because the family blocked entrance to the Walmart toilet to a Walmart employee while their mother was using it. The story claims the employee was “shoved”. This doesn’t sound like such a big crime. In the parking lot, “police officers contacted nine members of the Gaver family and were attempting to separate them for individual interviews when the fight broke out” which resulted in the wounding of Officer Daniels and David Gaver (18) and the fatal shooting of Enoch Gaver (21). The interesting thing about the report is that it avoids the direct statement that Daniel’s leg injury was the result of a shot fired by the Gavers. It was this claim that so far has been used to justify the fatal shooting of Enoch Gaver. The officer who fired the fatal shot at Enoch Gaver has not been identified, although he can be quite easily seen to fire the shot in the video. He pulls his revolver and fires a number of shots, one directly into the back of Enoch Gaver who is struggling on the ground with Daniels, and another into David Gaver’s stomach. None of the Gavers were armed. Whatever the truth is about this event, it seems disappointingly strange that for a mother to have some privacy in the bathroom, we have to end up with three people shot and one fatally. Surely this didn’t need to reach the stage it did.